TO AMERICA’S VETERANS: THANK YOU! Military Author Radio, www.militaryauthorradio.com with Director Dr. Tom Gauthier and Dari Bradley CEO of Patriot Media, Incorporated, are proud to continue to promote Military Authors in support of the Military Author Industrial Complex. We’re glad to have Dr. Gauthier back on this special Veterans Day Program, and together, we are honored to host Mr. Holly Rees, a WWII Veteran as our guest. There are not many WWII Veterans left, especially those who’ve been wounded in combat. Be sure to join us for a fascinating program as we salute our nations Veterans on Military Author Radio. Welcome to Military Author Radio Veterans Day broadcast! Holly Rees is a WWII Veteran of the Army of the United States, a combat soldier who served in Okinawa. He is also the author of the soon to be published book: Three Flags and Two Brothers: To War and Back. 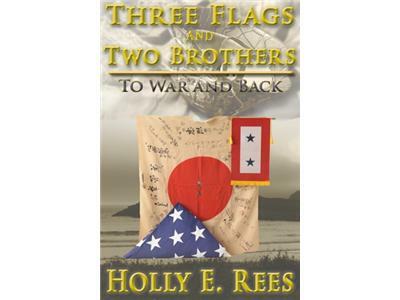 Within Holly’s detailed account he includes stories and fascinating photos, along with information about his brother Gil Rees, and his US Navy combat experienced. Rees provides an impressive log of combat ships, weapons, ammunition, and real life experiences.